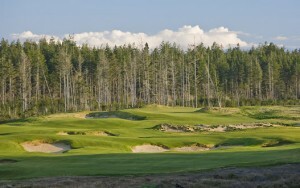 Old Macdonald, the fourth course at Bandon Dunes, opened on June 1, 2010. To mark the first anniversary, I’m posting an excerpt from Dream Golf that provides a glimpse into the dynamics of the design team — the relationship between Mike Keiser, owner of the Bandon Dunes Resort, and co-designers Tom Doak and Jim Urbina, with cameo roles for design consultant Brad Klein and some of Mike’s friends, or “retail golfers.” The morning described is November 5, 2008, the day after the presidential election, and Mike had flown that morning from Chicago to Oregon. By ten A. M., Pacific Coast Time, Mike was standing on the first tee of Old Macdonald, holding an umbrella to protect him from the rain. It was cold and steady, a heavy-duty coastal drizzle, but Jim Urbina didn’t seem to notice. Jim had been Tom Doak’s right hand man during the building of Pacific Dunes; here at Old Macdonald, his role was much the same, but his billing was different. At Mike’s request, both Tom and Jim were listed as co-designers of Old Macdonald – or Old Mac, as everyone seemed to call it, going with the inevitable nickname. With Tom scheduled to arrive later in the day, Jim was conducting this walk-around. Drops of water beaded on his black jacket and dripped from the bill of his black cap, but Jim was too absorbed in his task to care. In Mike’s description, Jim is “one of those dirt guys who can do anything – and he’s also a natural showman and storyteller.” Dark-eyed, olive-skinned, and animated, Jim is passionate in his beliefs about golf course design, and he was into Old Mac all the way, blood, guts, and feathers. His voice brimmed with excitement as he explained the strategies of the opening hole, a short par 4 called Double Plateau. “Width is good,” Mike said. “We like width.” But he did have plenty of questions. How far away was that fairway bunker on the right? 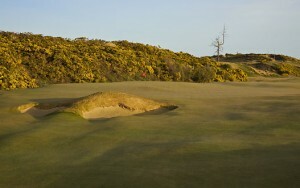 A tour player could blast it right over that bunker, but could he? Would it catch his drive? Could he get out of it? Was it too severe for an opening hole? 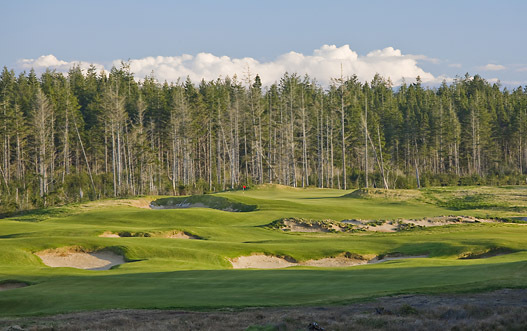 Mike, however, regards himself as the voice of the retail golfer – the golfer who pays the freight at Bandon. When everyone reached the green, dominated by a pair of mounds that formed the double plateau, Jim talked about how fond Macdonald was of this green configuration, and how often he and his associate, Seth Raynor, had employed it. Nearly every course they built, he said, had a double plateau. Still, Mike wasn’t convinced about these humps that were of the size usually described as elephant burial grounds. He had another barrage of questions: How high were those mounds? Weren’t they higher than the mounds on the Double Plateau at National? They looked higher. Were they flat enough to hold an approach shot? Not just a wedge shot, but the kind of approach he might hit? If he was on the wrong plateau, could he two-putt? What if his approach hit the side of a plateau – would it bounce off the green altogether? How far off would it run? Jim’s eyes sparkled. He was prepared for these questions. Almost every answer contained a quote or reference to Macdonald, whose views on golf architecture Jim seemed to know by heart. If any project was going to get Jim’s creative juices flowing in full flood, it was Old Mac. The first classical course that he’d ever made a special trip to study was National Golf Links, the course on Long Island that stands as Macdonald’s most definitive statement on golf design. And the first golf architecture book that he ever read was Macdonald’s book, “Scotland’s Gift – Golf.” Out here in Oregon, he carried his well-worn copy in the cab of his truck. “The red book,” he called it, and it was his Bible. The discussion of the Double Plateau ended with an agreement to reconsider the height of the mounds. “I am a leveler of greens,” Mike muttered as the group trudged toward the nearby 17th hole, a par 5 that was just beginning to take shape. Jim was eager to show Mike a new tee site, though it was difficult to see immediately just how the hole would play. A small marsh encroached on the right side, a hill on the left, and in the middle of what seemed to be the fairway there was a ditch, a gash about eight feet wide and six feet deep. “That’s our burn,” Jim announced, sweeping his arm like a magician making a revelation. In classic design, the burn – the Scottish term for small stream — has a pedigree that goes back to the Swilcan Burn at St. Andrews. At various points in the design process at Old Macdonald, there’d been talk of incorporating a burn, but the right opportunity hadn’t presented itself. Now Jim thought he’d found just the place. This 17th hole called for alternate fairways divided by a hazard of some sort. Why not a burn? As he described the tee shot, and the way the burn would wind through the fairway, Jim seemed to see it already, filled with clear water flowing between green banks. Mike was still seeing a muddy gash. In general, he was partial to the idea of a burn, and he liked the way the burns influenced play at St. Andrews and Turnberry, but the idea of a burn on this hole caught him off guard. Jim had sprung a surprise, a tactic he often used in his work with Tom. When he wanted to make a strong suggestion, Jim would sometimes go ahead and rough in a feature so that Tom could actually see it, an approach that was more dramatic than simply describing what he had in mind. In this case, Jim hadn’t gone to the trouble and expense of digging a big ditch just to make a suggestion. That ditch had been cut to accommodate the main stem of the drainage pipe that would run through the course. When he laid eyes on it, Jim couldn’t stop imagining it as a burn. For the next half hour, the group mulled over the burn and milled about, looking at potential tee sites and landing areas, trying to gauge what effect the burn would have on the playing of the the 17th hole and on the overall experience of the golf course. Some were intrigued, some bemused, some turned off. Mike didn’t seem smitten, but he said diplomatically that he’d wait to hear what Tom had to say. Then he and his buddies hustled off to get in a wet round of golf before dark. That night, at a long table in the rear of the Gallery, the main restaurant in the Lodge at Bandon Dunes Resort, Mike hosted a dinner for the design team of Old Macdonald, and all the main players were present: Jim, the members of the advisory panel, and Tom, who’d arrived on schedule and spent the afternoon at Old Mac, getting briefed on the walk-around he’d missed, and taking a hard look at the burn. Before the first course was served, Mike rose to make a toast. He was dressed casually in shirt and sweater, but he sounded dead serious when he lifted his glass. As he saluted the talents and contributions of the course designers, there was a sense of we’re-in-this-together, an attitude of damn-the-torpedoes-full-speed-ahead. “To the success of Old Macdonald,” he said in his ringing baritone. “You’re that passionate about it?” Mike asked, smiling at Jim’s melodramatic plea. That remark carried a sting, but it drew laughter, even from Jim. 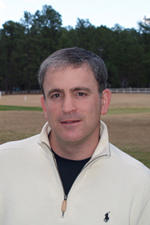 Brad, an editor of Golf Week and prolific writer, was the member of the advisory panel who could be counted on to deliver the acid comment. Jim took his seat, but the discussion banged on. It wasn’t exactly music to Mike’s ears, but it was evidence of healthy conflict. There were sharp opinions pro and con, and the discussion didn’t end until Tom agreed to sleep on a final decision about the burn.